Acrylics Anonymous, Issue #022 -- Fake It Til You Make It. 5 Tips to Help You Sell Your Work. If you want to sell your paintings, consider at some point that they will become an investment for someone. Use good quality canvases and paints, and conserve them as well as possible. No one needs angry investors! Mark & cohorts from the Lennox Artspace are running a "Postcards Of Lennox" competition, open to everyone. Great prizes and exposure in a gorgeous part of Australia. Prepare Your Art To Sell. Here's some ideas to improve your chances, and some strategies to help avoid disappointment. We're going to hold our first worldwide webinar early next year. Wooooooh! We're thinking a 15-20 min tutorial with a half hour question and answer session at the end. Please contact us if you are interested in "attending". Type "webinar" in your comment! While having a look for more articles to support selling your work or preparing your work for sale, I came across this informative article. If you're anything like me you'll search in a few different places (on the web!) for information. The more you read about how to sell/ship/prepare your paintings for sale, the better equipped you will be to actually do it when the time comes! A great little post with some excellent tips for selling your art at outdoor or remote locations. Some really great ideas you might not have thought of yet. Thanks to the good people at Fidelis Art Prints for this one! I 'met' Cleo the eagle owl on a visit to a birds of prey centre in the UK. I was compelled to paint her even if it was a stretch for my artistic skills at the time. Cleo was my fourth painting and lack of confidence, having no clear idea of having how to approach the painting and inexperience were my biggest difficulties. 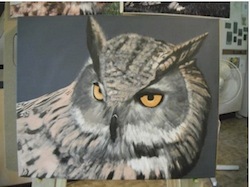 My absolute love for the owl was the only thing going for me really. 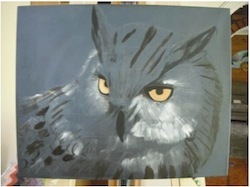 I underpainted the entire canvas in a blue grey which compliments the distinctive orange eyes. I drew in a rough line drawing using a pastel pencil and a combination of free-hand drawing and gridding. I then started to roughly add in blocks of colour focussing on darks and lights. I continued to build up blocks of colours in layers, refining and adding detail along the way. I struggled when applying the colours and I think it was because I let the canvas get too dry and wasn’t using enough paint. In the final layer I sharpened the detail, increased the tonal variations and added some glazing to the eyes. I kept painting even when I didn’t know what to do or how to go about achieving an effect. I trusted that if I just kept going the painting would develop. I’m happy I did because Cleo remains one of my favourite pieces." 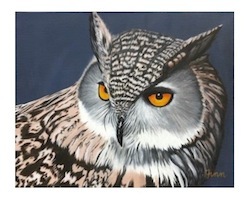 Thanks for sharing your story Sandra - we can see how much you loved Cleo - it shines through in your painting. Well done!